Out of all of the preschool alphabet book crafts that we have made over the past few months, this uppercase letter K king was probably the most fun we’ve had with one of them. It is such an easy one to put together and your preschooler really gets a chance to show off their creativity while decorating the crown. In fact, if your little one is anything like my oldest, they’ll get so excited over using glitter to decorate, they’ll forget all about the fact that they’re actually learning letters of the alphabet. Cutting out the pieces to put this one together really shouldn’t take you too much time at all. With just two pieces, you and your preschooler will fly right through it. So first things first, gather up your supplies! The supply list for this particular craft is really more of a set of suggestions or ideas rather than a list of things you actually need to have. For the base though, you’ll still need your sheet of white card stock and the “parts” of your letter K king. From one color of paper, cut out a large uppercase letter K and from the other, cut out a shape for the crown. If your child is old enough for scissors, this is a fantastic time to practice those scissor skills as cutting out the crown is simple straight lines! To assemble your alphabet book craft, start by gluing the letter K onto your card stock. Try to have your child keep it near the bottom of the page so that they have plenty of room to add their crown and its decorations. When you’re ready for the crown, have your child glue it onto the top of the letter. There really are no steps here. Just set out some craft supplies (buttons, sequins, glitter, etc.) and let your little one go to town! To keep the glitter explosion at least somewhat contained 🙂 we put our alphabet book craft onto a larger sheet of construction paper. This makes it a bit easier to gather up the excess when you’re done. 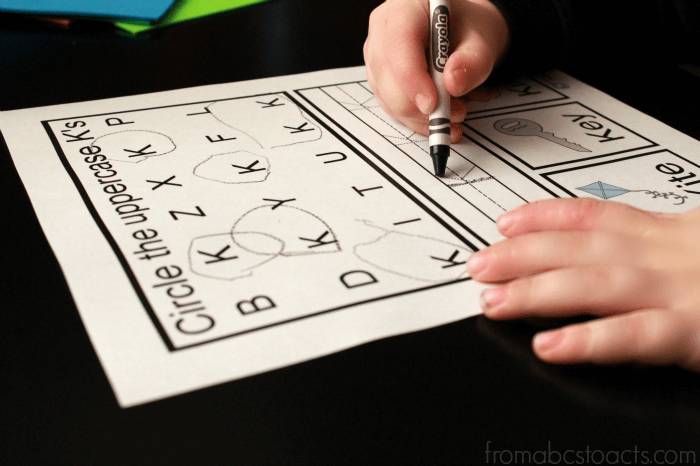 Of course, with all of that glue, your letter K craft will need a little bit of drying time, so while you’re waiting, go ahead and grab the uppercase K alphabet book printable below to practice writing the letter!